JIM CRAMER: All right. Spotify, I’m a big user. David’s a big user. I know Carl is as well. DAVID FABER: Yes, we are as well. JIM CRAMER: They just bought two podcasts. Company is also out with earnings. It was a nice beat this morning. And this is a big, special exclusive interview for us. 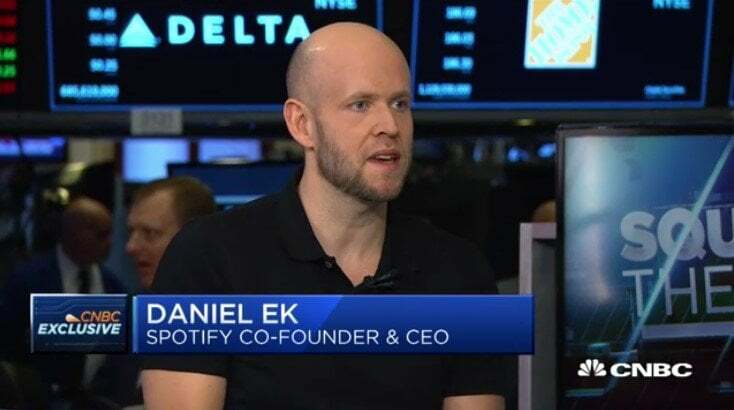 We’re quite excited about this Spotify’s Co-Founder and CEO Daniel Ek, right here, post nine. Daniel, I’ve got to ask you, right upfront, podcasts: I understand they’re red hot and what we want is an aggregator. I didn’t think that a music company would do it, but I do think that an audio company would do it. And hat’s what this is about, isn’t it? DANIEL EK: Yeah, it is really about expanding our mission from just being about music to being about all of audio and being the world’s leading audio platfor. And what we are seeing, really is -- we have done podcasts for two years. It is -- our users are listening to podcasts are listening to the platform almost twice as much. And, of course, the growth in podcasts for us has just been phenomenal. And that’s part of the reason why we’re now making this move. JIM CRAMER: I would also imagine that podcasts are a gateway drug for the rest of your products. DANIEL EK: Indeed, yeah. I mean, great example would be we had in the fourth quarter Amy Schumer and Joe Budden on the platform. Those are all appealing to very different types of audiences who are now trying Spotify for the first time and noticing all the benefits that the platform has. JIM CRAMER: Now, you’ve got a Netflix lineage. We’ve got Barry McCarthy, the CFO who is quite -- let’s say he’s pertinent or germane on the conference call and he says things that I think are a little unusual. But yuou use algorithms, you always seem to know – for instance, we use Spotify at our restaurants, we always – we’re never worried, you always seem to know what we want. How is that possible? DANIEL EK: Well, it is really all down to the team of both editors and the machine learning team that we have at Spotify. And we’re looking at more than 16,000 signals every single day as we look at your taste profile and try to rank you the things you like the most. So I’m glad that that’s working well in the product. DAVID FABER: You know, there have been those who thought that podcast was a fad. Why would we go back to something like talk radio? You’re finding it is not. The listening patterns are consistent. Is there real growth in the potential audience, though, as well? DANIEL EK: Well, the growth has been really spectacular for us. And just shy of two years we have become the second biggest podcasting platform. The types of experiences that we’re seeing podcaster doing is vastly different than just the normal talk show radio. There is literally shows like Serial, which is drama that is acted out, and there is kids’ shows that are now coming, including news, The Daily, being great examples of podcasts that are doing very, very well. DAVID FABER: Your investors, however, may look at your stock today, down a bit and also sort of wonder about the long-term, which I know you’re thinking about. You know, one question I got from a number of people who owned the stock for a while, what about long-term guidance on your margins? Which I think you said it was between 30 and 35% at some point. Does that hurt -- does this new effort hurt that long-term guidance on margins? And should they expect perhaps a different metric? DANIEL EK: No. We’re staying steady with our long-term margin goal. We never said that it would be a linear path to get there. But I think looking at it in our fourth quarter results you can see that the margin is going up. It is very strong. Our core business is very strong. What we’re doing now in 2019, however, is we’re investing in more original content on the platform. That will broaden the appeal. It will broaden the engagement, which of course is a virtual cycle that then grows the platform and leads to more profitability long-term. JIM CRAMER: You know, I’m following you guys pretty closely and like your company ever since you became public. And one of the things I thought you would do is not get trapped by the four calls of the spreadsheet. I view you as Netflix, the more great content that you add, the more I want to own the stock. I don’t really care, things happen as Barry McCarthy said in terms of the range today. Why are you trapping yourself? Why are you not going with something which just says, you know what, we got a Netflix idea here, Mr. McCarthy is from Netflix, we understand the more content we add, give us a chance, don’t look at this as a snapshot, if you want to know the key metric, advertising, going to premium, is what we care about. Why did you revert to traditional guidance when your company is bigger than that? DANIEL EK: Well, I mean, again, we have always strived to be a very transparent company and we do give a lot of detailed numbers on the guidance. And obviously this is a new business line for us. But I think the way in looking at the potential of the business, it is very much more to be said. We are investing in more original content that will broaden the appeal of the platform. And as we’re doing that, we believe obviously subscriber, engagement will go up which increases our long-term opportunity. DAVID FABER: We know what Netflix spends a year to acquire content. It’s nothing like where you are, I mean, we’re talking 12, $15 billion a year. But can you give us some sense of what your expectations are in terms of how much you will spend to acquire this original content? DANIEL EK: Yeah, I mean, again, it is really right now from a very low base. But I don’t think it is unlikely that it is Netflix type of story than if the magnitude of the numbers won’t be the same, of us doubling that investment year over year to get more and more content. DANIEL EK: Yeah. Exactly. We’re definitely investing a lot more in getting more original content on to the service and you should expect that going forward. And as long as we’re seeing cost of engagement numbers, the content, we’re investing in, you should expect this to make those investments. JIM CRAMER: it’s funny. I like the Apple service revenue stream. And when I saw it, I know this company, the big one, it’s a Brooklyn company, so I followed Brooklyn companies because I lived there, I was hoping that Apple would make this acquisition. The reason I say that is because people don’t -- unless you listen to the podcasts, they are very millennial, and they are very much the way people multitask now. Do you see yourself buying all of them that are left, so that I know if I want -- that you become synonymous in podcast? DANIEL EK: I don’t think we have to buy all of the companies that are in this space. There is a tremendous – a lot of these companies. What we feel very strongly about is we want to be in the game, we want to be the platform that these creators come to and go to. And, again, as you mentioned, I would say -- we’re very much focused on being audio video is a huge space. It has the attention of everyone right now. But we think audio being almost two hours of consumption per day is a massive opportunity that no one is really paying attention to. DAVID FABER: You said you have line of sight, sorry, Jim, on 4 to 5 million on multiple acquisitions this year. And then you just said that may double, am I correct? So it could be as much as a billion in 2020? DANIEL EK: Not really in terms of just acquisitions. What I was talking about our content investments that we’re making. So part of what you should look in terms of our going forward forecast is both acquisitions, but then it’s also our own efforts in investing in creating these shows. We had 14 exclusive shows in the fourth quarter of 2018. We’re doubling down on that. And we want to grow the number of shows that we have. JIM CRAMER: I am so impressed with the subscribers by region. It’s something that you originally told me, your company told me could happen. Just gonna go— 30% North America. Latin America, 20%. Rest of world 10. You’re pretty much, year-end here, you’re up 40%. Does podcast, do they fly in every region? DANIEL EK: Yes. You would be surprised. It has grown very, very fast. Germany is a great example. We’re already there. The number one player of kids shows right now, so you see young consumers are going to bed with Spotify, listening to stories in a big, big way. So, even the perception in Germany wouldn’t be that Spotify is just about music, it is really all about audio already. JIM CRAMER: So this is important because when I watch Netflix, I never watch it in dubbed. I always watch it -- you have to watch the titles, it is a different show than if you listen. Will you translate everybody’s great stuff for United States? DANIEL EK: I think there is definitely that opportunity of taking the shows that are working really well in these different geographies and translating them across the world. DAVID FABER: What about the car? Do you have a sense as to how many people are listening to you in an automobile? DANIEL EK: Yeah. I mean, we’re doing very, very well in the car. I think last number we gave out is that there is more than 50 million of our users who are using Spotify in the car. So it is definitely a big part of our business. DAVID FABER: And do you -- do you have any sense the growth of that? Obviously there is competition in the car in the form of Sirius, which many people know, but even beyond that, some of the others. Is it growing substantially? DANIEL EK: It is growing really, really substantially. I think the number one metric that we look at is dual platforms. How many of our users are using it on more than one platform? And what we’re seeing is that that number is increasing dramatically as more speakers come into play, as cars are getting more and more connected. So it is really a big part of our story. The other thing that we see is those people are more than twice as engaged as the average user as well. So it is an important part of our overall story. DAVID FABER: When you look at the competitive landscape, Daniel, obviously you were early, you sort of -- in the days of piracy, you transformed and really streaming, you’ve been the leader. But Apple is out there with a product. We don’t talk very often about it. Amazon. They’re both incredibly deep pocketed companies. Do you believe if they wanted to that they conceivably could spend enough money to push you out of your leading market position? DANIEL EK: I mean, these are formidable companies. No doubt. But what I look at is obviously how our business is doing and we had a phenomenal Q4. The other part that I look at is we’re really just focused on audio. That’s how you should look at this. There is a ton of things that these other companies are doing, self-driving cars, whatever other businesses they’re into. And I believe in this day and age that you need to be very, very clear with your brand, what you are for consumers, in order for them to take it up. And the best experience wins. And now we’re adding the best content to that as well. And that’s now Spotify. JIM CRAMER: I don’t know whether you’re familiar with Tien Tzuo’s work from Zuora, but the subscription economy and subscriber’s, it’s a great book, he always says ‘Watch churn.’ Churn shows you loyalty. You’ve got some of the stickiest churn I’ve ever seen. DANIEL EK: Yeah. And it is trending as you can see, the churn is decelerating. JIM CRAMER That’s positive – we should tell people that that’s good. DANIEL EK: Yeah, yeah. Churn is definitely decelerating which is a very positive metric that we’re keeping track of. And of course, at the same time, you should look at the announcements that we’re doing today – as I mentioned, it broadens the appeal of Spotify, it increases the engagement. If it increases the engagement, we think it has the opportunity of also lowering churn even further. JIM CRAMER: And how about Google? DANIEL EK: Yes, Google is obviously the same category as I guess all of the other F.A.N.G. companies. DAVID FABER: It wasn’t that long ago that you guys went public. I remember it. I don’t think you were actually even here at the time. You chose to list as opposed to raise capital. Are you happy with that decision? DANIEL EK: I am. Indeed. It was obvious that a big decision for us to make, but it felt like the Spotify way of doing it. It wasn’t just about doing it for the sake of everyone else doing it. And we’ve always said that we’re a long-term thinking company, and I think we proved that with that move. DAVID FABER: Tell me more, what does “the Spotify way” then mean? It just means doing it differently or the way you need to? DANIEL EK: It’s about being transparent and it is about, in this case, trying to align the incentives of everyone. And in our case, we didn’t need to raise additional capital. And we wanted a way to provide not just our existing shareholders with liquidity, but also our employees. And that was an important part for me of avoiding that traditional lockup process for our employees. DAVID FABER: And well, for the sake of transparency, we’re very happy to have you, but sort of curious as to why you’re suddenly communicating in this way. Can we expect to see more of you in this sort of a public setting, articulating some of the things you’ve just done here? Or is this going to kind of be a one-time only and we’ll never see you again? DANIEL EK: No, I certainly hope to be available and transparent. That’s certainly what we want to be as a company. And I would encourage both of you or everyone else, by the way, to reach out to me on social platforms and I’m happy to respond to questions there as well. But I think this is obviously -- marks a shift in terms of people’s perception what have this company is. And that it’s very important for us to state very clearly why it is and that we’re excited about this future. JIM CRAMER: Let me go back to something that we wanted to drill down on -- sharing stuff. This Google. I didn’t want Google to be a throwaway. The premium subscribers. Google Home promotion marked the first hardware bundle offer ever in history. This worked big for you. Are we going to see Amazon? Are we going to see -- who else do you do this with? Because to me this is premium, and premium is the way that I want to judge you. DANIEL EK: Yeah. I mean, we have as a core part of our strategy we call Ubiquity, which is being on all platforms. DANIEL EK: So we’ve got 500 of these partnerships going, and obviously what we saw was our members were asking for these voice speakers. We saw a clear opportunity to provide that with an amazing experience. We saw that people who were already fans of the google assistance wanted the Spotify experience, so we’d be happy to extend that so Samsung, of course. JIM CRAMER: Samsung’s car, because can you do with Infotainment and do it with HARMAN. DANIEL EK: Yes. Of course. JIM CRAMER: What do you think of Facebook? DANIEL EK: Facebook, again, is an exciting company. We have a long relationship with Facebook. If there are opportunities, we would love to work with them. JIM CRAMER: So you don’t mind what happened with Facebook in terms of the world -- you are a company driven by morality. You have no problem with Facebook. DANIEL EK: No, look. I mean, at the end of the day we want to be where our users are. DAVID FABER: Just getting back to many so of the financials and things that some of your investors care about. What are your expectations in terms of negotiations with the labels and what’s going to actually occur there? DAVID FABER: You have access to enormous amounts of data that conceivably would be helpful in terms of where people are listening, how they are listening and who they are listening to. DANIEL EK: Exactly, including the 16,000 data points that we’re gathering every single day through the taste profiles. That’s a huge part that we’re able to connect these two in a way where it’s positive for users and really positive for artists as well. JIM CRAMER: I don’t want to be too Bobby Kennedy-like, but if we just think about now, no, but if we dream things – the stickier you are, I’ll go back to the churn, I mean, a lot of people looked at Netflix at $6.95, They said it’s never going to be anything. I mean, when I see the low churn, I think that one day you could raise prices, that you’re a little bit more stickier, and, therefore, we should be modeling higher prices down the road. DAVID FABER: $14.99 is enough, I think. JIM CRAMER: No, come on. DAVID FABER: What do you think? DANIEL EK: I mean, look, again, all I can say right now is we’re in this growing the market phase. We’re not in – trying to capture all the profits side. JIM CRAMER: David, take the commercial side. Go listen to the commercials if you have a problem with 14. DAVID FABER: I think we need to get into the podcasting business is what I think. DANIEL EK: Yes. Thank you for having me. JIM CRAMER: -- with an unbelievable company that people better start understanding, because they will want to only stock if they do rather than the ridiculous four walls that the analysts are coming with -- with the neutral. I’m not neutral.